As you guys are probably well aware by now, I have an almost 7 month old daughter who is my very favorite thing in the entire world. Hands down. She was born in December, and for my birthday, my sister had a lovely ring made for me with a Topaz (December's birthstone) stone, and my daughter's name engraved on this inside. It's so special and personal, and I treasure it so much. So when Gemvara contacted me about working with them to design a piece of jewelry, I knew that I wanted to create something along the same lines - something beautiful and unique, dedicated to my Essley. 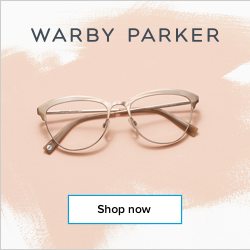 For those of you who aren't familiar with them, Gemvara.com offers customizable fine gemstone jewelry online - with 29 different gemstones, 9 precious metals, and hundreds of styles to choose from. 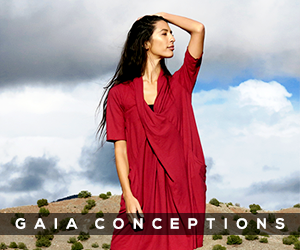 What I love most about them is that they allow you to create a truly one-of-a-kind piece that captures a personal story or unique inspiration. From rings to necklaces to earrings to bracelets and more, they have endless options for creating a piece of fine jewelry exactly to your liking. And each piece is crafted by hand, by artisans in their Gemvara New York workshop. How cool is that? I had so much fun on their website, looking through all of the stunning options they offer and trying out different pairings until I was able to fully customize the exact piece that I wanted. I ended up putting together a necklace: a round-cut solitaire pendant in 14k white gold, paired with an 8mm Blue Topaz gem, and 1.4mm 14k white gold cable chain. 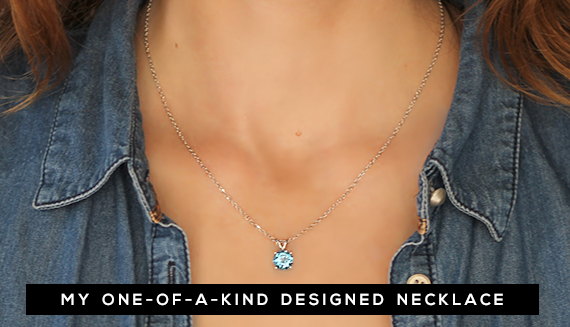 I wanted a simple and timeless design, with a delicate chain that would really showcase the Blue Topaz, in honor of Essley. The process of designing exactly what I wanted - from the type of accessory itself to the choice of metal and weight, to the size and color of the gemstone, to the style of the chain - was so easy and enjoyable from start to finish. To be able to create such a meaningful piece of fine jewelry, with each detail precisely the way I wanted it, was a really incredible experience. When it arrived and I saw it in person, I actually got a little teary. It's absolutely flawless, and I've been wearing it everyday. I plan to pass it down to Essley when she's older, so it's kind of a family heirloom in the making. Even the packaging was gorgeous. It also came with a certificate of authenticity that lists the fine metals and stone, and states that it was designed by me. So, so special. And now that I've gushed about how much I love my necklace, I get to deliver the best news of all. 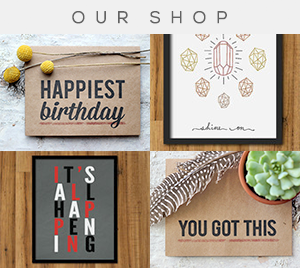 One of you is going to get to create your own special piece (or pieces!) 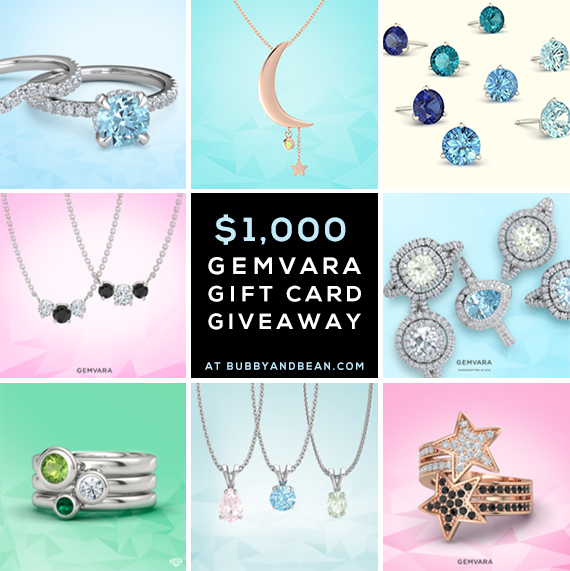 of fine jewelry at Gemvara as well, because they are giving Bubby and Bean readers the chance to win a $1,000 gift card (yes, $1,000)! Just use the entry form below. There are several ways to enter. This giveaway will run through July 30th, 2014 and is open to Bubby and Bean readers worldwide. The winner will be randomly chosen and announced here shortly after. 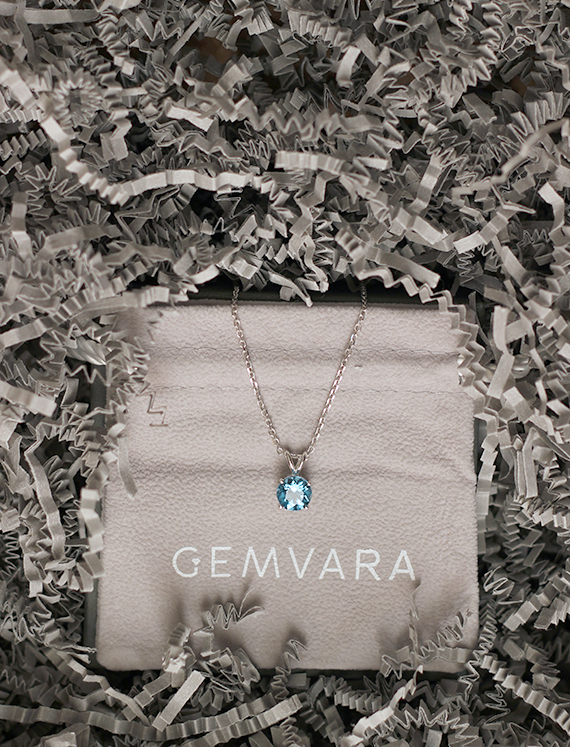 Many, many thanks again to Gemvara.com for giving me the chance to create such a lovely, meaningful necklace, and for giving Bubby and Bean's readers the chance to win a truly incredible prize! Good Luck! 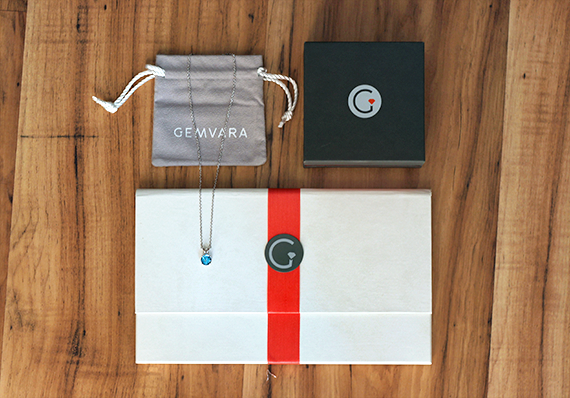 This post/giveaway is in partnership with Gemvara. All opinions are my own. Thank you for supporting Bubby and Bean by allowing me to share occasional sponsored content. Gemstones By The Yard 5-Stone Necklace is absolutely adorable! I absolutely love their emerald-cut solitaire pendant with the periodot stone! I love the delicate star pendant! Love Disc Bracelet!! So nice! Thank you! I love the Renee ring in white gold with garnet! PS The necklace you designed it so beautiful! i love the grace ring!! thanks so much! The stackable rings are awesome! What a fabulous giveaway! My favourite items are the earrings, CUSHION-CUT STUD EARRINGS. Thank you! So hope I win...would be the perfect birthday gift for me! Oh and the Catherine ring is one of my favourites! Everything is gorgeous, but I really love the Gemstones by the yard solitaire (5mm gem)!! i am in love with the custom key necklace! 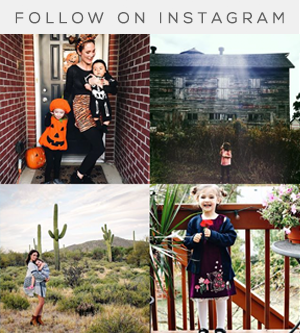 This is a perfectly timed giveaway for me! I'm getting engaged soon and we're in the process of selecting a unique ring. Love this! Thanks so much for a lovely giveaway, Melissa! I love the strand band in white gold! First, awesome giveaway. I feel in love with the stackable amethyst ring. http://www.gemvara.com/jewelry/grace-ring/round-fire-opal-18k-white-gold-ring-with-smoky-quartz-and-rock-crystal/xxzx1 Oh totally in love with that site. Boyfriend is going to have his work cut out for him! What an awesome giveaway! The jewelry is so precious and beautiful, not too much with just enough sparkle! I love the slim 9-gem ring! Simple & sparkly! I love the Lotus Stud Earrings!! Love the necklace you designed but love the stackable rings too! I'm in love with the stackable rings, but I also love that necklace, because both my daughters are December babies! I really, really like the stackable rings. Especially the Twine Band in 14K Rose Gold. Gorgeous! I love the "love letters" necklaces. I would get an A with blue topaz for me and my daughter who are both December babies with A names. The Star Flower Pendant is so pretty! I was literally just on Gemvara last night checking out their selection of wedding bands! I LOVE the JARDIN BAND! I just got engaged two weeks ago and these wedding bands are gorgeous! Love the rich and thin band. The Gemstones by the yard 5 stones necklace is also pretty! i love the Written in the Stars Ring! :) Its simple yet such a nice piece. 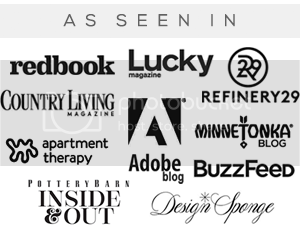 I have been looking for a company just like this. 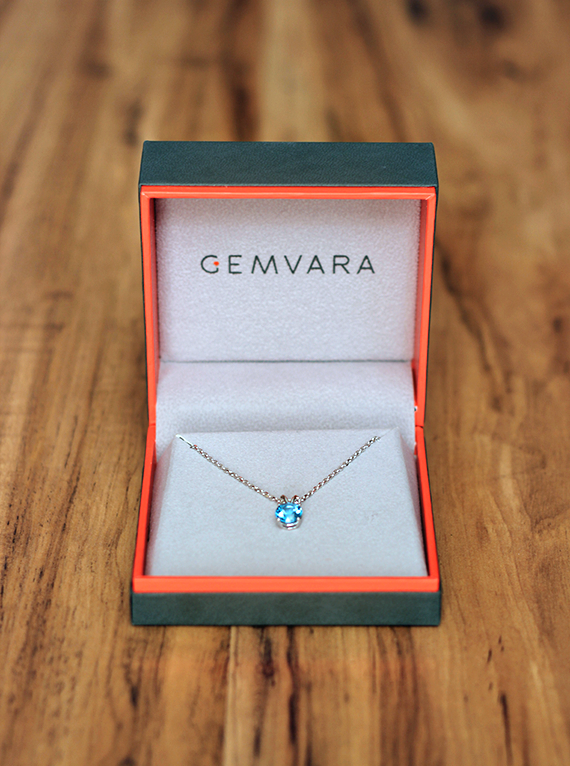 I'm so excited to be introduced to gemvara. What a wonderful shop and giveaway, thank you both!!! absolutely beautiful. i love stacking rings with my wedding band. i'm putting the heartbeat band on my wish list. great giveaway…thank you. be well!